Main reasons for global trade declarations include weak investment, slower trade liberalization, and reduced formation of cross-border production chains, APEC SOM 2017 Chair tells gathering. APEC SOM3 began its discussions in Ho Chi Minh City on August 29, focusing on preparations for the APEC Leaders’ Week slated for November in central Da Nang city. Deputy Minister of Foreign Affairs Bui Thanh Son, who is APEC 2017 SOM Chair, highlighted in his opening address the strong outlook for the Asia-Pacific region, as heard at the recent third meeting of the APEC Business Advisory Council (ABAC3). “But the bright prospects for growth, as well as for trade, hinge on the policy choices and actions by economies,” Mr. Son was quoted by the Vietnam News Agency as saying. As suggested at ABAC3, the main reasons for global trade declarations include, among other things, weak investment, slower trade liberalization, and the reduced formation of cross-border production chains, he added. He therefore underscored the need to look carefully into APEC to see what can be done. APEC has performed quite well to date, particularly with major actions committed to by trade ministers, the APEC SOM 2017 Chair said, noting that progress has been made in all committees, working group, and sub-forums, as well as in a number of new initiatives. More than 200 meetings have been held across the numerous workstreams of APEC. Over the past ten days alone, a series of almost 80 meetings have been organized, including many significant, high-level events. According to its agenda, SOM 3 is expected to cover a lot of work, including reviewing the work of the Economic Committee (EC), the Committee on Trade and Investment (CTI), the APEC Steering Committee on Economic and Technical Cooperation (SCE), and the Budget and Management Committee (BMC), and building on the inter-sessional work to finalize the proposed outcome documents for potential submission to leaders and ministers. According to Mr. Son, Vietnam, as the host country, will also update APEC member economies on preparations for the APEC Leaders’ Week as well as major events in the lead up, including the Women and the Economy Forum and the SME Ministerial Meeting. He expressed his belief that with their combined wisdom and hard work, goodwill, and determination, the APEC economies will secure positive outcomes from this meeting and lay the crucial groundwork for a successful Leaders’ week. The two-day meeting also looked into APEC committees’ work in support of the APEC 2017 priorities and SOM-level issues. The delegates also discussed the next steps in developing the APEC Post-2020 Vision, including the possibility of a Leaders’ statement on APEC Towards 2020 and Beyond. At the meeting, the EC proposed officials approve two important documents: the Framework on Cross-Border E-commerce Facilitation that Vietnam has promoted in recent times, and Best Practices on Promoting Supporting Industries in the Asia-Pacific Region. They also looked into initiatives and proposals in preparation for the APEC Leaders’ Week. 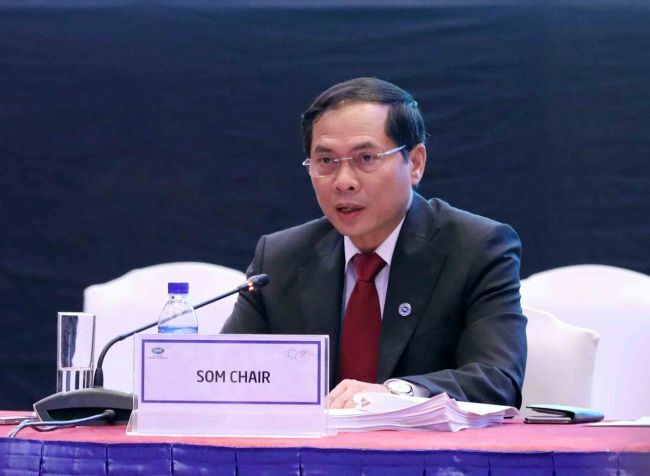 According to Mr. Do Hung Viet, Assistant to the APEC 2017 SOM Chair, during more than ten days of working sessions, SOM3 and related meetings featured nearly 80 meetings of APEC committees, groups and forums, with the participation of close to 3,000 delegates. Mr. Rory McLeod, EC Chair, was quoted by Vietnam News Agency as saying that they have discussed structural reform, how to make the market function better, the ease of doing business, and competition policy. “We are working on helping people by improving training, the availability of work, and making sure that the labor market has protection for workers,” he said. Asked about the agenda for SOM3 proposed by Vietnam, Mr. Arthayudh Srisamoot, Director General of the Department of International Economic Affairs at Thailand’s Ministry of Foreign Affairs, said that the agenda is comprehensive as it covers a range of issues, from trade, the economy, and finance to connectivity, prosperity, and the development of people in the region. Ms. Kathrn Heather Barbara Clemans, a delegate from the US, said that all the initiatives proposed are to help people in APEC economies build the skills necessary to be able to operate in the new economy and also provide a venue for officials to be able to take policy decisions that also benefit people.